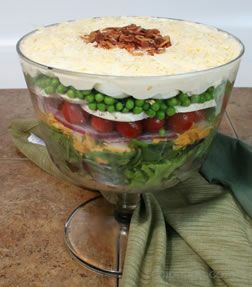 Beautiful layered salad with peas and onions surrounded by a creamy mayonnaise dressing. Place 1/3 of lettuce in bowl. 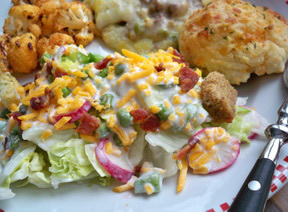 Dot 2 Tablespoons of mayonnaise, top with 1/3 of onions, sprinkle 1 teaspoon sugar, 1 dash of salt and pepper. Add 1/3 of peas and cheese. Repeat layers twice. Don't toss. Chill and toss just before serving. Sprinkle bacon on top.